I love love love this idea! How unique! Can't wait to see the final version! Love these ideas - especially the dandelion design. Such great ideas! I'm like you, I've been obsessed with our invitations since day one of being engaged. For some reason, they've always been the number one priority and since I'm DIY-ing ours too, I spent months trying to get the design perfect. I can't wait to see how your turn out! Haven't heard from you on the blog in a while -- I hope everything's coming together for your May wedding!!! Good luck!! Hope you'll post pictures!! 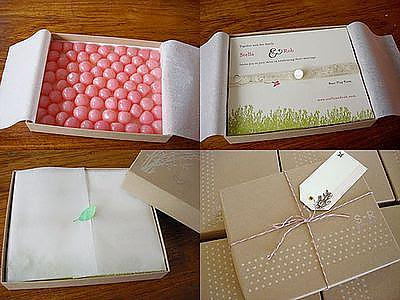 I love the boxed invites idea. When I was in college, I used to send my friend puzzle postcards - like where you write on the back of a puzzle and you break up the pieces. The person receiving the postcard then has to assemble the pieces to get the message. I think that would be a fun way to do your wedding invites! HAHA - I was also an un-engaged gal who bought a wedding mag or two (and hid them from my now fiance). Congrats on your upcoming wedding... I love finding other blogging brides! It's so much fun planning and writing about it! 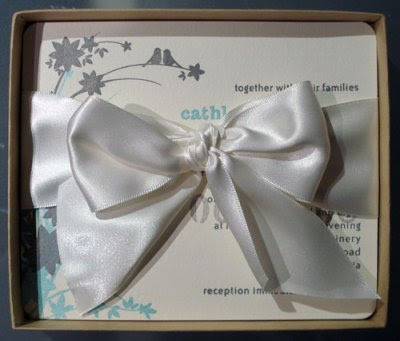 I love your boxed invite idea. 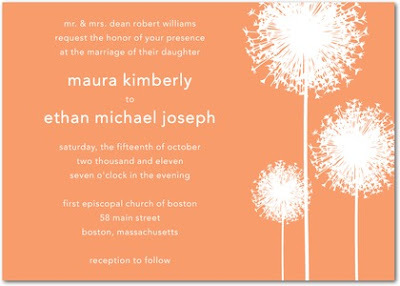 I love the dandelion design of the invites you picked out.